Seven children were hurt as the Ukrainian military shelled the city of Slavyansk, a stronghold of the protesters, in the country’s South East on Friday night, Pavel Astakhov, Russia’s ombudsman for children’s rights, said. “According to the public health department of the Donetsk regional administration, seven children were injured by bullets and shrapnel during the bombardment by the Ukrainian army,” Astakhov wrote on Twitter. Self-defense forces in Slavyansk say the Ukrainian military shelled the town’s residential area during the night, with one of the shells hitting a children’s hospital. A children’s clinic was also damaged by artillery fire, the ITAR-TASS news agency reports. On Wednesday, a school in the Artema residential district of Slavyansk was bombarded and one of the shells blasted through the roof of the assembly hall. Fatalities were only avoided because teachers and pupils managed to find shelter in the basement of the school building. 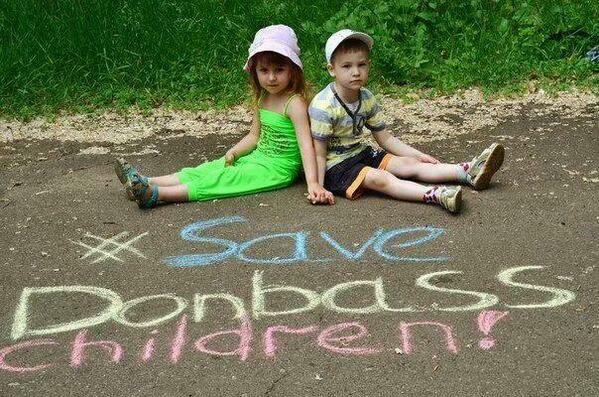 In his interview with the Rossiya 24 channel, Astakhov said that an online action called ‘Save Donbass Children’ (#savedonbasschildren) has been initiated via social networks. “I want to appeal to the leaders of all states around the globe to urge [Ukraine’s president-elect], Petro Poroshenko, to save the children of Donbass,” the ombudsman stressed. Last week, Astakhov wrote to United Nations Secretary General Ban Ki-moon and the OSCE (Organization for Security and Co-operation in Europe) to attract attention to violations of humanitarian law and the Convention on the Rights of the Child by the Ukrainian regime. He also urged international organizations to put pressure on Kiev in order to provide a humanitarian corridor for the people to be evacuated from the warzone in the South East of the country. The evacuation of kids from Slavyansk is already underway, with 200 youngsters sent to Artek children’s camp in Crimea, Russian media report. According to RIA Novosti, there are also plans to transfer another 300 children to Svyatogorsk and other towns in the Donetsk region (where the situation is calmer), as well as health resorts in the Odessa Region. The Slavyansk administration says that it has received over 1,000 requests from parents, who want their children evacuated from the town, which has been besieged by Ukrainian forces for almost two months. There are 5,000 pre-school children and 12,000 kids between 6 and 17 years old in Slavyansk, the administration added.